I’ve been neglecting this place again, haven’t I? These last two weeks were a bit *meh*. I had to briefly go to Finland again for work and once I got back I wasn’t feeling 100%. But I never feel sick enough to justify to myself to stay home and I also don’t easily go to the doctor. So I kept working, even if I did feel all that. And then last week I really wasn’t well. I felt hot, too hot, so hot. And I wasn’t hungry. Ugh, food, no thanks. And tired, so tired. But after a couple of days with extra sleep and a couple of fever tablets, the problem was solved. More or less at least. Normally I was also going to visit a newborn baby, but I thought it a bit irresponsible with the way I was feeling. I would have never forgiven myself if I got mum or baby sick. So the visit got postponed to Monday, which gave me some more time to finish my gift. 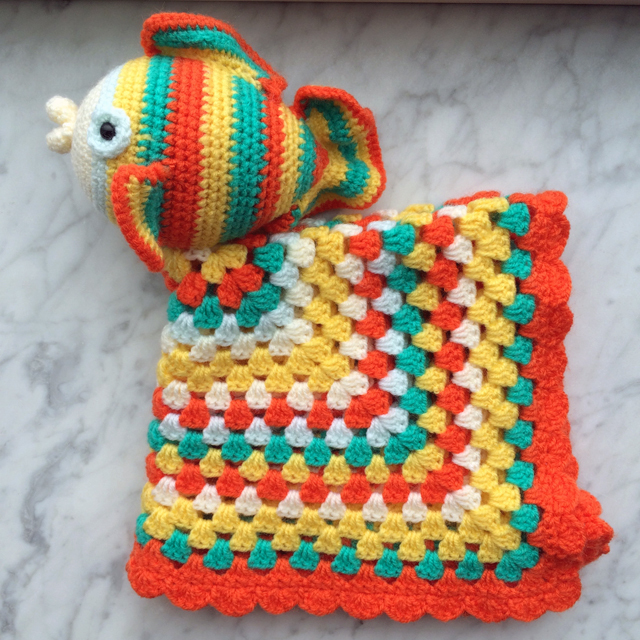 A security blanket with matching softie, a fish this time. This wasn’t inspired by the announcement card, but fish were the overall theme. 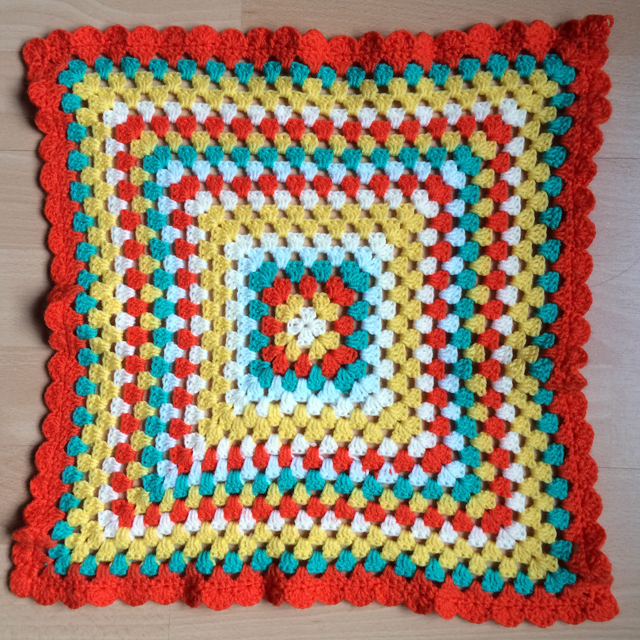 The security blanket is a simple, old-fashioned granny square with a shell edging. 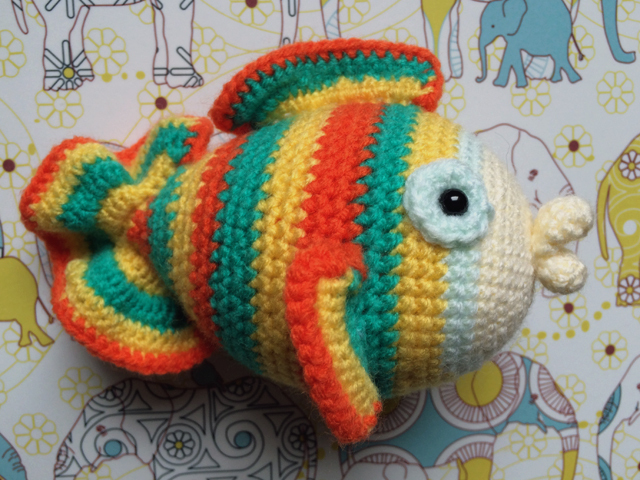 The fish was made using an existing pattern with a couple of changes like the lips and eyes. 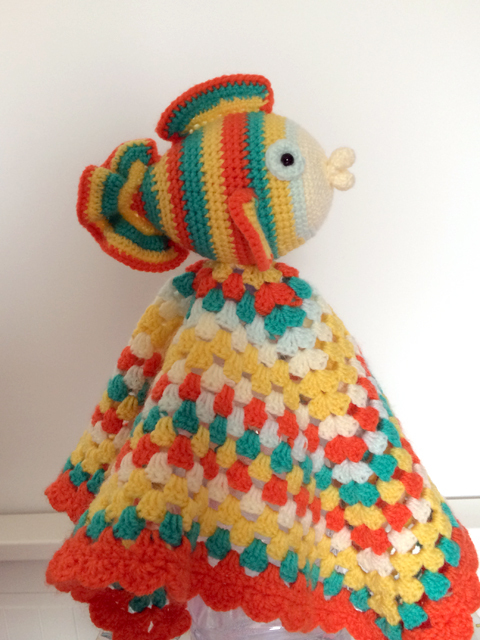 And then all that was left was to sew the fish to the blanket. As always I was a little apprehensive about giving the gift. I have one bad experience where the mum looked at my diy-gift as if it was something I had dug out of the garbage. This experience always makes me a little anxious for future home-made gifts. Well, some people can’t appreciate them, that’s just so. Yarn: Zeeman Super soft in pastel yellow, pastel green, yellow, green and orange.